Are Pig Ear Chews Bad for Dogs? Pig ears look fairly harmless, and your pooch probably finds them delicious. But despite their tasty appeal, the snacks can be unsafe. From blockages to chipped teeth, Rex takes a risk if he eats them, so proceed with caution, and always supervise when he chews on them. Also, be advised that much safer alternatives exist. While they're safer than knuckled rawhides -- whose knuckles can break off and cause big problems -- pig ears still cause issues. The danger of pig ears centers mostly around the small pieces that can cause blockages in Rex's intestinal tract. Some canines, especially aggressive chewers, have a tendency to break off large pieces or swallow pieces without properly chewing them. In an article penned for PetMD, veterinarian Patty Khuly notes that pig ears can damage some dogs' teeth and that veterinary dentists warn against them. Strong rubber chews are a much safer alternative to pig ears. Such chews, often in the form of a bone, typically have a smooth or ribbed texture. They're much more difficult for dogs to break chunks off, though you should still supervise Rex with it. Provide only a chew that's recommended for his size and that cannot fit all the way inside his mouth. 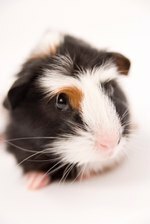 PetMD: Greenies and Rawhides and Pig Ears: Oh My! Are Rawhide Dog Chews Bad for Dogs?